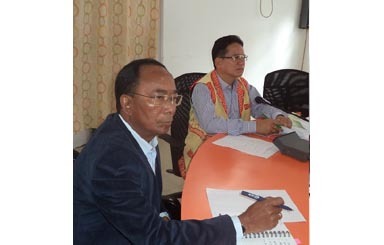 East Siang Deputy Commissioner, Tamiyo Tatak has asked all departments, banks & other service providers to do their best to provide people centric services through the one -day Jan Sunvai (Administration at your doorstep) Programme. This is to ensure that all services and information of various benefits and schemes of the State and Central Government can be availed by people. Tatak was addressing HoDs , representatives of banks among others in the morning at DC Conference Hall at the coordination meeting. We all must be committed to make all the services available to people during the one-day Jan Sunvai on July 14 at IGJHSS Auditorium, Pasighat and catch up with all the other districts which have already provided the doorstep services and schemes at the doorstep of the people. Every section of society from farmers students, patients, Bank customers, pensioners, traders ,electricity, water and other consumers among others should get the benefit from the one-day Jan Sunvai, he added. The DC stressed on coordination and team spirit of the departments. Later during the coordination meeting, the DC also took stock of the preventive measures and other disaster management issues in view of the Monsoon season. The DC asked the concerned department and stakeholders to constantly monitor the condition of the highways, rivers and vulnerable and disaster prone areas and various other essential infrastructures. He also instructed the Health Department to keep in stock all required medicines in PHCs and CHS, particularly in rural and remote areas. On the occasion, the DC also stressed on work culture, punctuality and sincerity in discharging official duties. Surprise checking through flying squad of the district will submit report of absentee officials for which strict action will be taken, he further cautioned on the occasion.